The unmatched sophistication offered by the Chanderi Sarees crafted by Mrignayani has made us one of the leading Chanderi Saree Retailers in Kolkata. Being operated by M.P.Laghu Udyog Nigam Ltd, Emporium Kolkata has over the years projected itself as a chanderi saree shop providing the best craftsmanship in the industry. We upgrade our skills, infrastructure, designing support, and tools so that every woman in Bengal falls in love with this Indian ethnic drape. Whether you are willing to flaunt it during the summer months or getting dressed for any occasion, the Chanderi Sarees offered by us can serve it all. 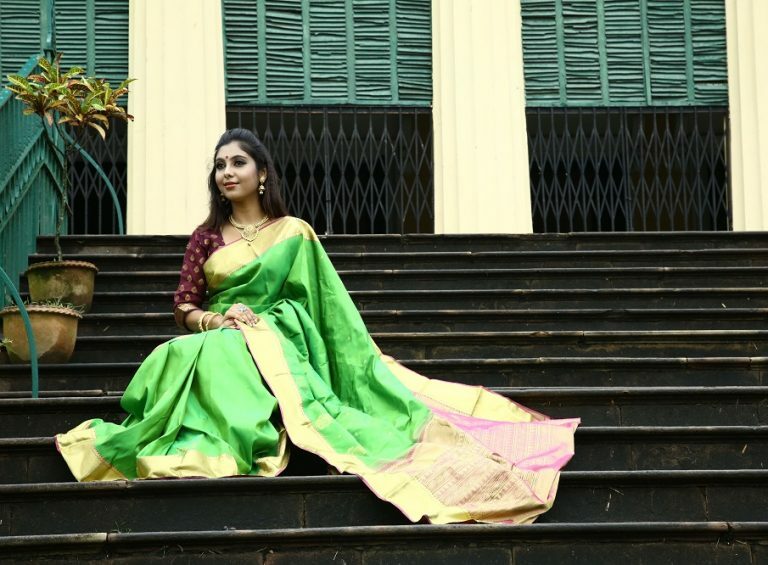 Since our inception in 1986, we have served the art loving people of Kolkata and its surrounding areas and sold unique Chanderi Sarees at competitive prices. Feel free to browse through our stock online and we can assure you that you will be spoilt for choice. The sheer texture, luxurious feel, lightweight, and other unique features of our Chanderi Sarees have drastically enhanced the demand for our sarees in the last few years. We even encourage, promote and direct the growth of Cottage Industries in India by providing marketing assistance. The weavers and craftsman employed by us are the best the industry has to offer. Each saree in our Assam Silk Saree Collection has been crafted from the rarest variety of silk in the world, known as the Muga Silk. The material of the silk used by us to craft Assam Silk Sarees is organic, natural, and has high durability. Opt for our Assam Silk Sarees and it will turn out to be one of your most prized possessions. Being crafted from the traditional ethnic fabric Chanderi, the Chanderi Sarees offered by us has a sheer texture, lightweight, and luxurious feel. The perfect blend of cotton yarn and chanderi fabric offers the sarees a shimmering texture. Its golden gaze sets it apart from the other traditional sarees. The motifs and colour of our Maheshwari Sarees are treated to be its unique features. Earlier they were crafted from pure silk, but now cotton and silk are used together. They have extremely light weight and so you can flaunt one with ease. Whether you are looking for Maheshwari Saree in darker shades or lighter ones, approach Mrignayani as we offer the widest variety. If you are looking for a saree which has a traditional touch and is ideal for every occasion, the Kosa Sarees offered by us is what you need. We use only premium quality fabric and advanced machinery so that each Kosa Sarees offered by us is one of a kind. Why Approach Us as Traditional Saree Showroom In Kolkata? One of the leading Traditional Saree Retailers in Kolkata having more than 3 decades of experience. Value the reputation earned by us and tries our level best to maintain it by offering traditional sarees of the finest quality. Offer ethnic attire in diverse colours, range, and designs which enhance the appeal and add a touch of contemporary.